For people on specialized diets, finding products that you can use in specialty markets can be challenging. For instance, finding products without gluten used to be quite the challenge, and now everything from cereal to gluten free fiber supplements can be found at your grocer. Additionally, years ago, people with lactose intolerance had limited selections when it came to milk based type products. Thankfully, this niche is finally being filled with offerings tailored toward people whose tummies rumble at the thought of cow’s milk or cheddar cheese. Lactose free protein shakes are finally becoming available thanks to soy products, and there is a diverse array of products to fit your needs. Everything from healthy meal replacement shakes, to energy bars and supplements, to lactose free protein shakes are now being made and marketing to the lactose intolerant crowd, and if you’re in that category, you’ll want to check out our list of top 10 lactose free protein shakes! 1. Optimum 100% Egg: NO Lactose and all egg, maximum protein from this amino acid packed powder that scores high on the list of lactose fee protein shakes. 2. Optimum 100% Soy Protein: Ideal for anyone looking for a low lactose, low carb and high protein option, this particular product is even marketed towards the vegetarian crowd. 3. Healthy N’ Fit 100% Egg Protein: Egg is not on your face if you’re lactose intolerant and pick up a two pound tub of this, a high ranker on the makeable nutritional shakes list. 4. MRM All Natural Egg White Protein: Dairy free and claims to promote healthy muscle maintenance! 5. Nature’s Best Isopure Smoothie: Lactose Free and aspartame free too! 6. Naturade Total Soy: Make a shake from this powerful powder, or add to food and other beverages. It’s versatility makes it a great choice. 7. Biochem 100% Berries and Whey: Lactose free, and who doesn’t love berry shakes? 8. Muscle Meds Carnivor: Rice protein provides another option for shake making powders for lactose intolerant dieters. 9. GNC Pro Performance 100% Egg: Egg protein in vanilla flavor. Note: Attempting to flavor your scrambled eggs with vanilla will likely not yield the tasty results of this shake powder. 10. Gary Nulls All Vegetable: This French vanilla flavor gets its protein from vegetables, but certainly won’t taste like them when blended into a delicious shake. Remember to discuss any and all supplements you are considering with your health care provider. He or she will discuss the risks of same with you, along with interactions with your current medications and medical conditions. It’s important to consult your physician prior to starting any diet and exercise plan for these reasons. Low Cal vs Low Carb Protein Shakes Compared! 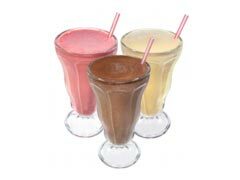 Best Meal Replacement Shakes For Men - Top 5 Choices! Weight Loss Shakes That Work Fast - Dangerous Ingredients Alert!